I find it pretty sweet to have the source code of each interesting Ludum Dare entry available, so when I’m curious about how somebody implemented some cool trick, I can just look at it. However, much of the code is undocumented and/or all over the place due to the jam’s nature. When you’re struggling to finish in time, the last thing you want to do is write comments and tidy up your code. Hi, I couldn’t finish my two last Ludum Dare compos, so I had to post a game this time, I only had one day but It’s done. Sorry, my source(capx) is a mess due to the lack of time. Despite all the work that’s piling up: Count me in. My entries can’t all be crap, right? Maybe this is the one. FWI: This is how it went last time for me. And yes, I’ll be shooting yet another little documentary like this about participating in the compo. Ludum Dare #36 – Why Am I In The Past? Who Cares! 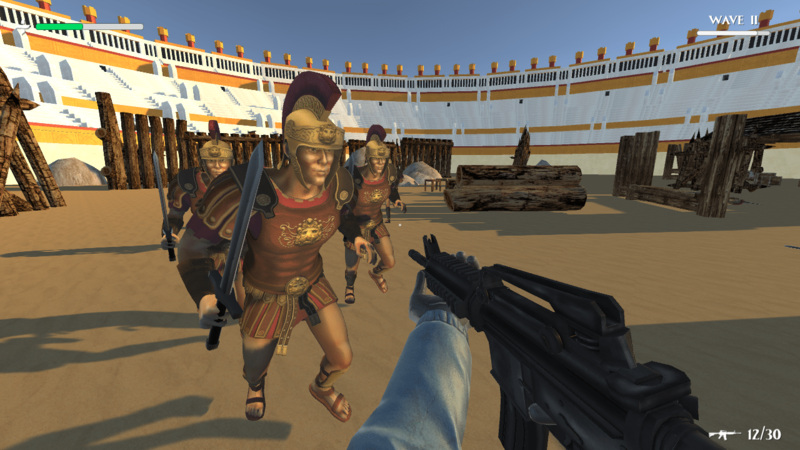 Shoot The Romans. I did try & paste the full post here, but unfortunately it was too media heavy and my embedded twitch stream clips were not working. If you’d like to read more, you can do so here. Yes – you read that correctly. We finished our Ludum Dare #36 game and the end result was “Why Am I In The Past? Who Cares! Shoot The Romans.“, affectionately known as #WAIITPWCSTR for short (videos included further below). Ancient vs. Technology comes to a head in “Why am I in the past? Who cares! Shoot the Romans” (or WAIITPWCSTR for short). You’re in the past for some reason. 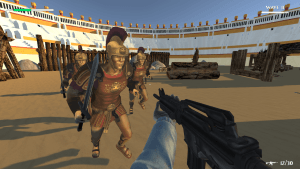 How long can you survive against hordes of aggressive ancient Romans? Pick up your gun and blast your way through history in this endless wave survival first person shooter. Check out the Ludum Dare link and let us know what you think. The premise is, pretty much, as it is in the title! We had an absolute blast making this, it really confirmed we had made the right decision in setting up Whitepot Studios, and more importantly, gave us a bit of validation that we actually can throw something together in 72 hours and have it be playable and downloadable. We made the 2D menu graphics/logo/HUD assets made from scratch, and the sounds & 3D assets were free online – most available in Unity Assets Store or FreeSound, although some texturing was done to them. 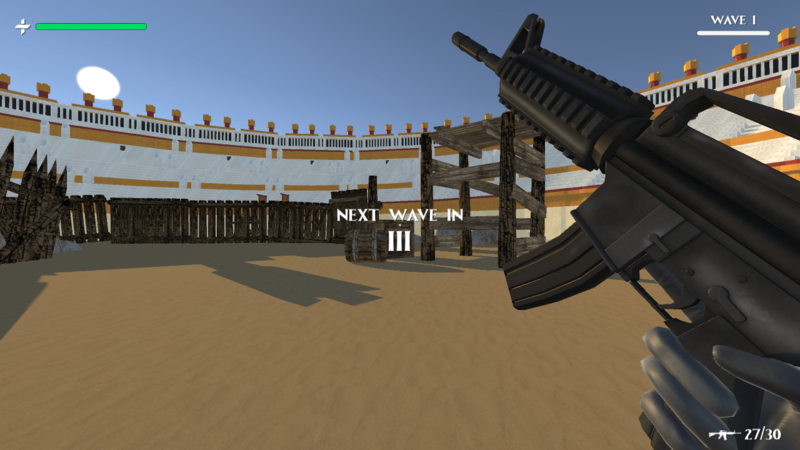 Something which we hadn’t done before, which was a bit baptism-of-fire-esque was send the link to some Twitch streamers to see them play it live once we had submitted to the Ludum Dare website. It was really nervewracking, and felt like presenting a university project all over again, except this time to anonymous strangers on the internet with little way to immediately interact with them the second something goes wrong. Anyway, 10/10 would do again. Yes, there were bugs, and yes, people found exploits – which was great! It meant people were playing it long enough to come across these issues and report them back to us. So, after begging all our friends to try it out, at my time of writing this, we have 50 downloads! 50! Just kidding, we don’t have 50 friends (haha), but we do have 50 downloads according to itch.io, which we discovered is a really nice way to host downloadable game files and get analytics also. We are definitely doing a post-compo patch, taking into account the feedback we have received and comments we received on the Ludum Dare entry itself. One great thing about Ludum Dare is the feedback system, which encourages you to leave feedback on other games so people leave feedback on yours. It doesn’t feel like a chore at all if you genuinely enjoy playing the games, giving constructive feedback, and getting new inspiration. You can interact with dinos already! Your spaceship crashed on Earth during the Jurassic Era. You need the dinosaurs help to get your ship fixed. Use basic ship functions such as alert lights to interact with their emotions and return home. So I’ve spent most of the day bug squashing (the bug in question is still in the game… It’s a very big bug, and needs a very big thing to whack it with.) and making the UI for this project. Which fora basic one I think looks pretty good. I’ve also been working on tweaking the tile shader a bit for a more prominant flash. Dinos don’t need no thought control! 16 queries executed in 0.123 seconds.